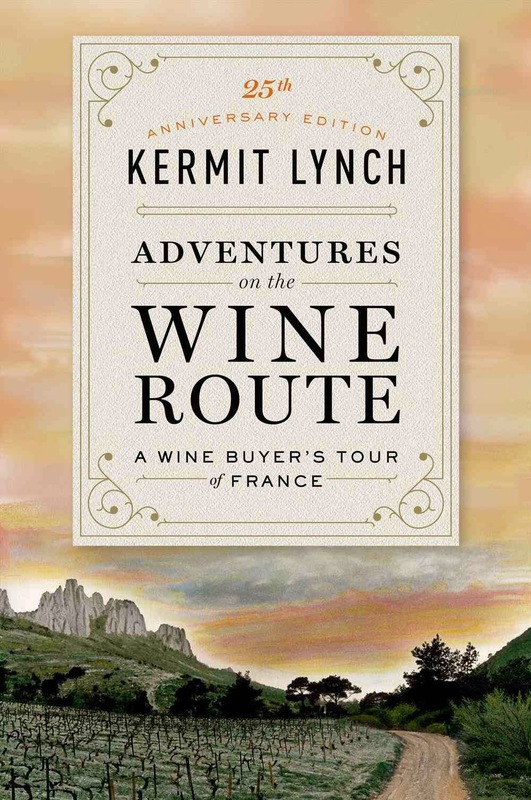 I found myself reading Kermit Lynch’s “Adventures On The Wine Route: A Wine Buyer’s Tour of France” with Anthony Bourdain’s voice in my head. Much like Bourdain, Lynch has been described as a curmudgeon-troubadour who doesn’t mince words. He’s opinionated, witty and pleasantly straightforward. Like Bourdain, he’s also open about his past experimentation with drugs: Bourdain’s ‘80’s SOHO sounds similar to Lynch’s ‘60’s Berkeley. Richard Olney, the American foodie who traveled through Provence with Lynch, once described his friend as an old-fashioned bohemian with a remarkable nose and palate. Lynch came out of the 1960’s San Francisco Bay revolution (he doesn’t call it a revolution by the way) with a relatively successful women’s handbag company. He was introduced to French wine during a transformative trip to Europe. Lynch returned from each trip to Europe with more undiscovered, small-batch wines. He chose to sell wines made in an old-school traditional style centered on terroir – each vineyard’s unique combination of weather, soil and geography. In other words, wine with a there-ness or a sense of place. He wrote and distributed very popular newsletters filled with anecdotes and stories of his travel. He called them little propaganda pieces. He described his wine in a fresh way. He introduced his customers to the characters behind the wineries. He avoided the trite, flat string of adjectives wine critics used. He gave many French wineries with unpronounceable names an American storyline. He advertised the fact that he personally tasted each wine he sold in his shop. He found, what we marketers call, a point-of-difference. You may not know who Kermit Lynch is or what he looks like, but you’ve probably drank the wine he imports into your neighborhood wine shop. He’s been knighted in France, he has two James Beard awards and he’s a trend-setter in the wine world. He’s probably the reason that people drink Bandol now and give two craps about Beaujolais – what he calls the most inspired invention in the history of wine. He told stories. He purposefully curated. Then in 1988, he wrote “Adventures On The Wine Route: A Wine Buyer’s Tour of France”. It’s a small and delightful book filled with insights, stories and anecdotes from his travels through the familiar wine routes of France. It’s a book at the intersection of history, culture and leisure. In 2007, the New York Times’ Eric Asimov called it “one of the finest American books on wine”. I’d also put it alongside Jan Morriss’ “Trieste And The Meaning of Nowhere” as one of the best travelogues I’ve encountered. Instead of letting others dictate what is deemed “good wine”, Lynch tells us to evaluate wine based on the environment in which it is served. He writes: “Rejecting a wine because it is not big enough is like rejecting a book because it is not long enough, or a piece of music because it is not loud enough.” Wine most certainly needs context, and to Lynch that context comes from food, friends, from whatever else is going on around the table. It is a wine philosophy very similar to his friend Waters’ slow food philosophy. He devotes just enough space to describe the technical side of the wine business. He’s a fan of the preservative sulfran dioxide despite his “natural” moniker and prefers subtle barrel-aging. He also spills the secrets of a great Burgundy: “a low yield, grapes as healthy as possible, vinified in wood, the wine not put through wild gyrations of temperature or clarification, aged in barrel underground where it is moist and cold, bottled unfiltered when the moon says its time. Above all, baby it along while following tradition.” What a letdown. I was expecting more. He describes the issues, trends and fads that many 1980s French wineries went through in chase of modernization. Many vintners started turning away from their heritage to embrace mechanical harvesters and testing chemical pesticides. They started heavily filtering their wines. Lynch stopped buying from those producers. He championed traditional methods. He wrote about it. For years, my father has opined that wine never tastes as good at home as it did while tasting at the winery. In his book, Lynch provides us an answer as to why this may be. He writes: “But then of course Cassis tastes better at Cassis! Debussy sounds better after a walk through the foggy, puddled streets of late-night Paris. You are in the midst of the atmosphere that created it. The wine is no different; the music is not different. You are.” To minimize this, Lynch has taken painstaking, not to mention more costly, measures to transport his wine from the cellar door in France to his wine shop in refrigerated crates to maintain the wine’s integrity. More recently, Kermit Lynch has been called a “California hater” after telling the New York Times last October that he had lost interest in California wines after vintners started making wines to please critic Robert Parker’s palate (oaky, intense, higher-alcohol). Chasing high Parker scores, in Lynch’s mind, would lead to higher sales, yes, but less diversity in wines. Less individuality. Less uniqueness. These words remind me of his critique of some French wineries in the 80’s. In future posts I’ll share my thoughts on a few of Lynch’s imports – that’s, of course, if Foodie-Girl lets me. While you wait, read his book. can't wait to share a "lynch approved" bottle with you … but guess I have to wait for you and Foodie-Girl get back from Napa….enjoy! I wager Foodie-Girl will let you post in the future. Excellent review. I love how you blend the old with the new, punctuated by what you feel is most important to know about Lynch. I'll buy the book and the wine, too.